Home sheep home is an exciting puzzle game for kids, which is full of joy and puzzling techniques. The theme of the game revolves around three main sheep characters Shirley, Shaun and Timmy. These fellows are stuck somewhere out and caught trouble to reach home. All three characters in the game have their own special abilities and role in the game. Shirley is the elder of all three, and is heaviest in his weight. He is very powerful. Shaun is the middle member of them, with moderate weight and size. Timmy is the youngest character that is very jumpy sometimes due to his low weight and small size. Stages: Three of them are funny and lively. They started their journey and walk together to reach their home. Only one player can play Home sheep Home at a time. You, as an operator have the task to guide and help them reach their destination. Different levels will take them to their home and you have to complete all those 15 levels one by one. Each proceeding level gets complex from the previous one, the puzzles get toughened. During the game, most of the time they need each other help, so make use of them to help the other fellow and play its role. Bonus: Another interesting feature of the game is Time Counter. The clock is running to detect your completion time, it counts how much time you take to complete a level. You get the bonus on each level completion if you cross it in minimal time required. You also avail a bonus if you replay a level and then complete it in lesser time than the previous play, each time. As an operator you have to be very tricky and clever to play the game. You need to use mental technicalities and abilities to reach the destination and solve the puzzling tracks, because there are many obstacles and puzzles on their way to home. But, no worries, you also have the option to turn on the "Play with Hint" option. This will allow you to solve puzzles with providing hints that would be illustrated on various occasions on diverse location. 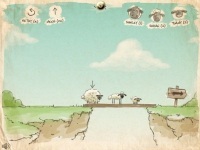 While playing you have to pick up one sheep at a time to help him walk all around and cross the boundaries. One by one you guide all of them to reach the destination in the minimal time. Here, there is also an exciting option! You can pick up your favorite character at first and help him. Simply drag your mouse to your favored one and click or use number 1 2 3 strokes (keys) to select any of them, then proceed. Use arrow keys to move forward, backward and jump them. This exciting game is available for free download to your desktop with a simple click. Have fun by popping groups of 2 or more like-colored balloons. Free drawing program designed especially for children ages 3 to 12. Good painting game for children with fresh features and easy interface.